A team of thieves hacked into banks around the globe, while foot soldiers withdrew massive sums from ATMs and bought luxury items with the stolen cash. The eight residents of Yonkers, N.Y. charged by federal authorities in the $45 million global bank heist were foot soldiers in the scheme, known as a "cashing crew." 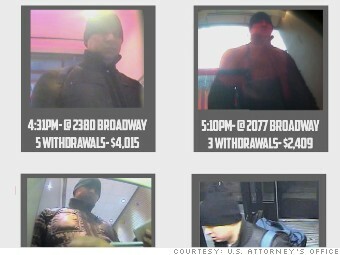 They hit ATMs all over New York City and stole $2.8 million in two separate attacks this past December and February.